It has been a week since I first arrived in Berlin, and I am thoroughly taken with the city. I have taken in two concerts (including a wonderful performance of Wolfgang Rihm's new opera, Dionysus), visited the Surrealist museum, edited and mastered two recordings for an upcoming album release, and, of course, drank a lot of beer. Since my last post, I have visited three of Berlin's many breweries. 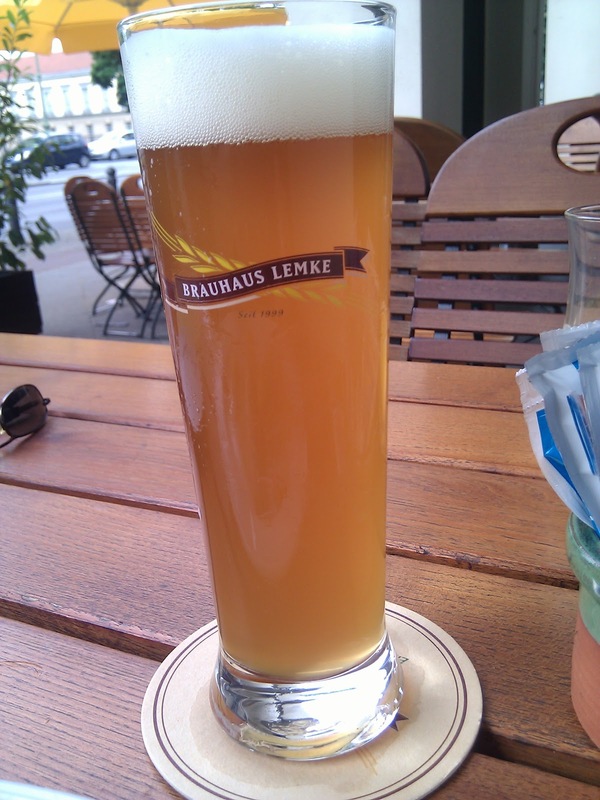 First, I visited Brauhaus Lemke, a pleasant little brewpub outside of the Charlottenburg Palace (there is also a location right outside Alexanderplatz). With lovely outdoor patio seating, the menu featured typical German fare and four housemade beers: Lemke "Original," a Pilsener, a Hefe, and a Maibock – the last two of which I sampled. The Maibock was the less remarkable of the two. A very subtle nose with faintly sweet aromas of raspberry and honey, it had an under-spoken mouth that was lightly fruity with a full caramel malt flavor and faint hops. The Weizen was tremendously light in the mouth, springy with flavors of lemon meringue, banana candy, bubblegum, and a deep bready finish. It wasn't terribly spicy with the cloves taking a definite backseat, and though it wasn't a standout Hefe, it was very enjoyable and accompanied my meal perfectly. The second brewery I visited was the Microbrauerei Marcus Bräu. I tasted two of their three offerings: a Pilsener and a Hefe. The Pilsener was a "C+" at best, pouring a very cloudy gold with no distinctive character or flavor. The Hefe was unquestionably among the worst Weizens I've ever tasted, bringing in flavors of dirty laundry and bleach. If this were the standard for the Berlin Brewery, the city would be in great trouble! But wait! 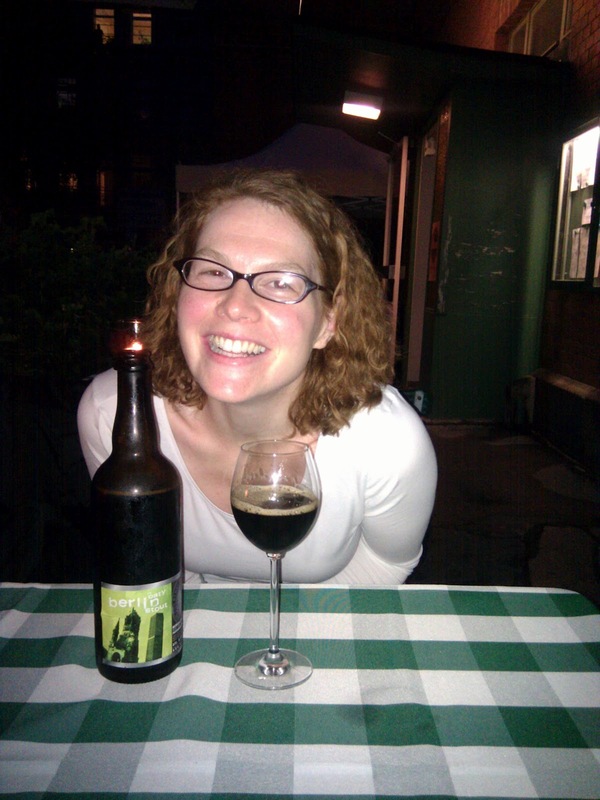 There is an interesting brewery in Berlin who brews beer well outside the national norm. Their name is Brewbaker, and they are but a mere 4km (or three train stops) from my apartment. Charming atmosphere, excellent fresh food, and a most pleasant wait-staff, my wife and I enjoyed an IPA and an Oatmeal Stout. Yes, that's an IPA and Oatmeal Stout being brewed in Berlin, by Berliners, for Berliners. I don't really know much about their history or their customer base, but it is encouraging to find some creative brewers within the city limits. Both beers were served out of 22oz bottles in wine glasses. 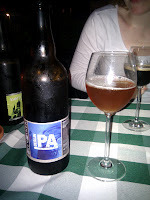 The IPA was an English-style IPA and is only the second German IPA I've had (the other being an American-style from BrauFactum in Frankfurt). The beer had a mildly citrus nose, was lightly hoppy with very little carbonation. The Stout – easily the better of the two – had a strong coffee aroma with a nice roasted chocolate malt flavor and a slight hint of bitter chocolate. 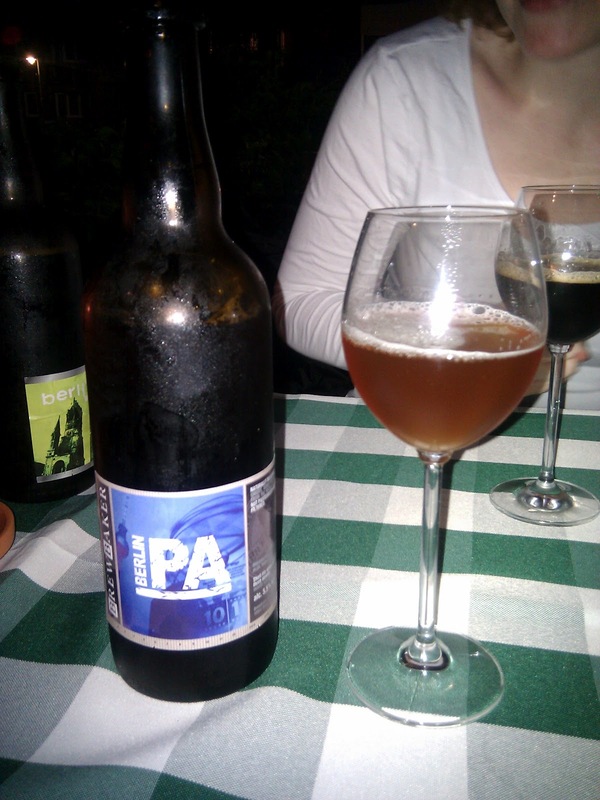 Both beers were well made, and though not extraordinary when compared to their brethren from other countries, easily ranked as the best beers of Berlin.